I have so many feelings about Sunday’s Fred Lebow Half Marathon. 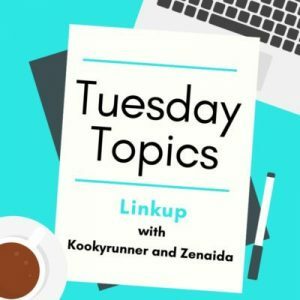 Linking up with Kim and Zenaida to share the good, the bad and the amusing about the race. 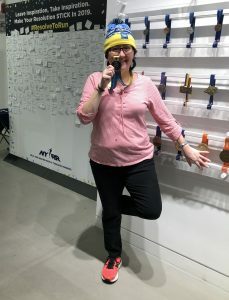 Because I picked up my hat so early, it was a disjointed “race day experience” and then I just repeated same picking up my shirt & bib for Gridiron while getting my medal engraved. I was excited to be running Lebow again, but I was nervous especially as my calf/achilles hadn’t fully resolved. My official race plan was to listen to my body and go as long as it felt safe. If I thought I was exacerbating whatever is going on, or if I was too cold/wet, I’d drop out. I finished happy. That was my primary goal and challenge with Achilles pain getting an assist from the weather forecast. I really didn’t expect the race to go on, and NYRR was fairly sure it would have been a fun run at best. They made the decision to go on Saturday morning and I was unsure. In the end weather wise, it wasn’t much worse than Brooklyn. 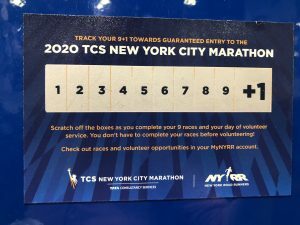 I was glad for the 8a start because by noon when I was headed to NYRR Run Center to have my medal engraved, the wind had kicked up big time. As of writing this Sunday evening, it’s 11 with a wind chill of -1. That would have been a much harder race. I finished strong this was fun. While yes, I wanted to be done in that I was soggy, I didn’t feel trashed and wasn’t really counting down the miles. There were moments, like between miles two and three when I was dreading Harlem HIll and ca. mile 7 when I wondered whether it would really be bad to sneak onto the Transverse to finish vs. heading into the passing lane for my 3rd and final lap. But overall I wasn’t counting down to the end. There were moments I wasn’t sure what mile it was. This was also surprising as I wasn’t sure what my cardio was given this weird cycle. 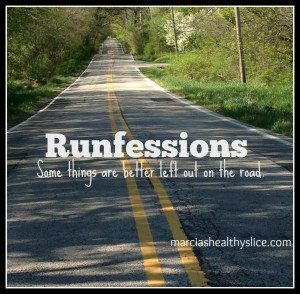 This had to do with pacing, no doubt, and more on that below, but it made me think I really will survive marathon training. I didn’t feel trashed at the end. Yes my calves are sore and I’m grateful to bengay, the foam roller and epsom salts, but I feel much better than I did after Lebow last year. 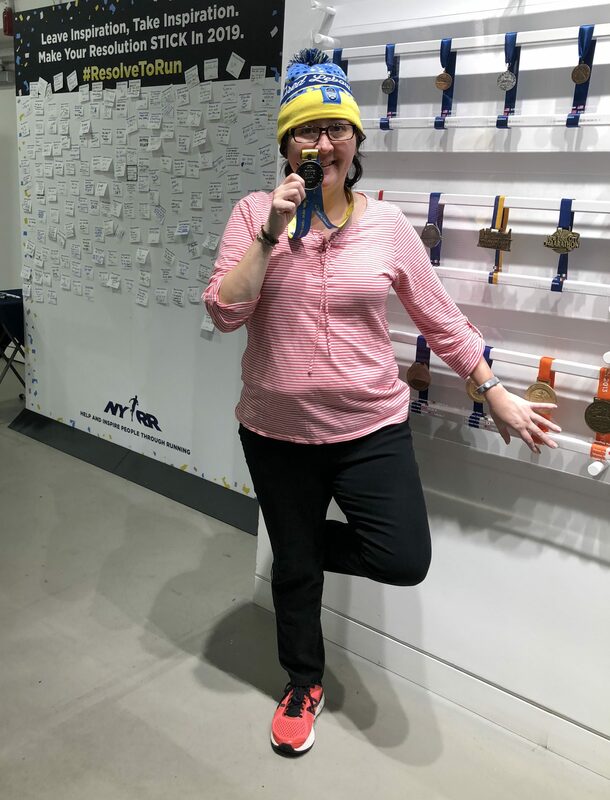 I was so excited to be able to flamingo when I went to get my medal. (I am a dork, yes. ) Granted, it was my good leg and I won’t be doing Tree with my left anytime soon, but I am wowed at this. As of Monday evening, my quads and knee are fine. I ran all of the hills. I actually ran 99% of the race. Walks were for fiddling with wardrobe and opening gel/chews and pouring a cup into my water bottle to top that up. This really surprised me since I didn’t think I was in hills shape. Looking at some of the splits, I’m not sure whether walk/run would have been better or not. I’m happy with my pacing. Speaking of, I let the pacers go before mile 2. 2:30 was the last set and I knew I wasn’t in 2:30 shape. I’d have blown up if I tried. I decided to treat this as a rainy, long, supported training run and just go at my pace. If I finished last, so be it. My watch was under my sleeves so I didn’t look at it very often. I was lapped by the winner between miles two and three and eventually lapped by 1:30/1:45 and pacers. “Last hill” when I was at mile ~7 and they were between miles 11 and 12 made me want to throw things. Although I thought I was losing time, I stayed with the same people most of the race. There was a lot of team work in helping open gels, get gloves on and off, etc. One guy paused to help me on Harlem Hill as I was trying to get gel out, put glasses back on and shove soaking wet gloves in my pocket. The new coat is probably what kept me from hating the race more. After a wet fun run a few weeks ago, I knew my jacket needed to be retired. It just didn’t zip all the way up. So Saturday once I knew the forecast was going to be WET, I went to Modells and got this after striking out at New Balance and Jack Rabbit. Nothing new on race day and all that, but folks had recommended it, it said it was breathable and it was perfect. On top I had a base layer, a tee shirt and a long sleeve top that I didn’t mind tossing if it got too hot/wet. When I went to change I realized other than base layer sweat, and the back collar, I was dry! I am similarly floored I had no blisters either from wet feet or new shoes, but when I went to throw out socks, the volunteer commented that he’d had a lot tossed in his bag, but mine were the first socks. Also, fresh socks in a ziplock in an inner pocket stayed perfectly dry. Best thing about four pockets, no need to wear belt although I hung on to my water bottle way longer than necessary and it would have been nice to have somewhere to put it. My fueling: more on the gels below, but in general it was good. NutriGrain bar in the Uber to the start/corral, Gatorade Apple Pear gel at about 10K and two vile Blueberry Gu chews toward the end. The gel was unplanned but went down fine since I wasn’t overheated.I thought I took a second one on the second lap, but apparently dropped it as it wasn’t in a pocket when I went to take it, hence two chews. The consistency of the Gatorade one was nice and the citrus was less glu-ey than vanilla, which is the only Gu my stomach likes. Fueling is going to be a fun challenge this spring summer. I have no idea what I’m doing for Ft. Lauderdale where heat & gel didn’t mix last time. There were rumors they’d be changing 9+1 just as they have been changing 4/6, but all is the same for 2020. Picked this up at RunCenter while waiting on medal engraving. 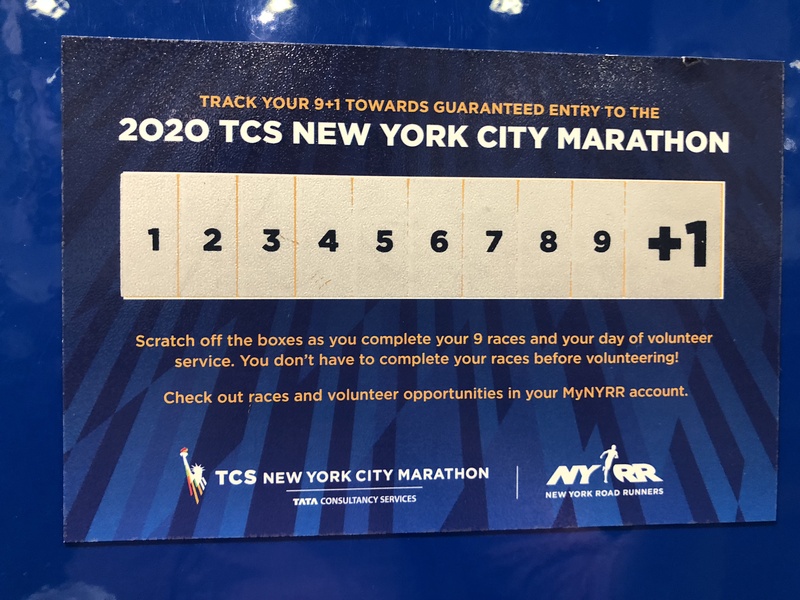 An interesting addition to 4/6 for 2020 for those of you who aren’t local who want to run the NYC Half is this $80/$100 Virtual Half in partnership with Strava It comes with guaranteed, non-complimentary entry and the virtual trainer ($30 value). Is it worth $50/$70 to bypass the lottery? It’s certainly cheaper than going the charity route. The medal. Well more precisely, the writeup on how it came to be. 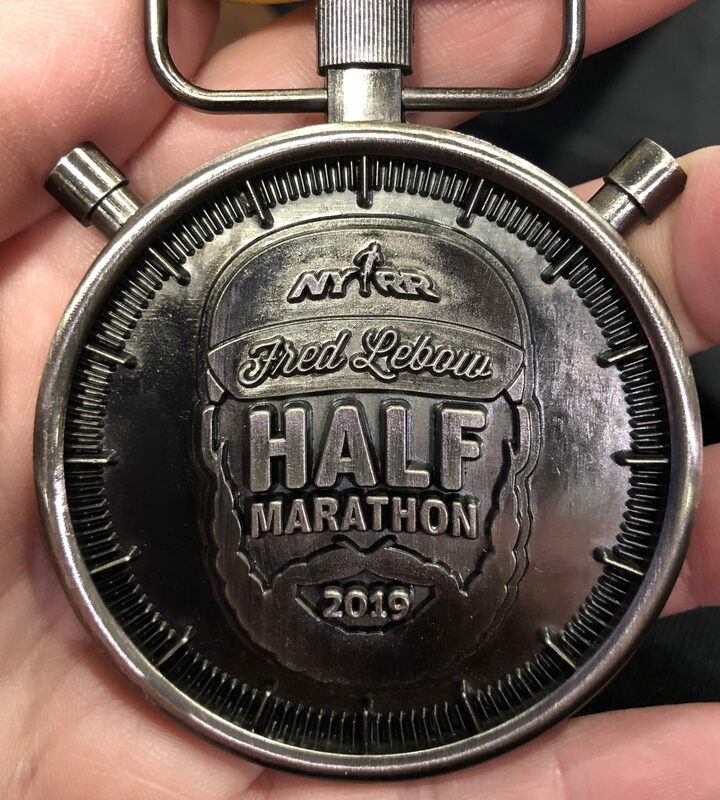 I’m not one who is driven by a race’s medal, but I love Fred Lebow, this race and the medal. My attire. I wish I had a photo, but I didn’t bring my phone because it was so rainy. Top layer for my upper body was a trash bag. Lower body? A heat shield from one of last year’s races. I actually ran in the heat shield for about half a mile and the trash bag until just before Cat Hill between miles one and two when I just got too warm. I was jealous of those who planned ahead and had ponchos. Flat Cari failed me. 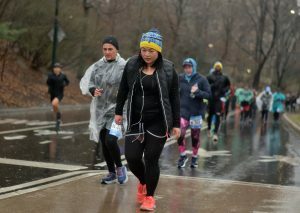 I learned from Brooklyn and laid out, among other things, two plastic bags and two NYRR gear bags to keep my feet dry until the start. I then left them in my apartment. Oops. I bought new chews on Saturday night, and promptly forgot to put them in my pocket. So I have them for Fort Lauderdale or a long run before then, and gummed stale blueberry ones. Overall, I was really happy with this race. Lebow was just as fun the second time through and I continued to learn a lot about myself. While at the moment I’m saying no more January Halfs! I think I know I’ll be back next year. What’s your favorite race that you return to? What’s your favorite I’d forget my head if it wasn’t screwed on moment? So happy to read this. I was worried that you would have our weather. I’m in awe that you ran the whole race. You’re going to rock the NYC half. I really need a rain jacket. I have a few ponchos but they’re annoying to run with. I have forgotten to charge my Garmin. That’s about it. Hope we both have dry Florida races. My friends were in Key West this weekend and it rained. I’ve seen modells on 34th. Never shopped there. My jacket is from Walmart and not breathable or waterproof. Light and has a hood. Yes Florida can be 40 or 80. We’ll see. I’ll see you maybe March 4-8 or for the Half. Stay warm and dry until then. Yay on March — why did I think you were here sooner? You too! I’m there feb 13-15. But I think you’re in Fla.
I’m here, but I have a work event 2/13 and fly 2/15. So maybe? I have tix to Billy Joel Feb 14. Will run on the High Line after work since the concert is not until 8 pm. I’ll be back for a whole week March 4-8.
sounds like why we both glossed over that week. Have fun! You did so well!!!!! I am always amazed at how well a race can go when one has the mind set of ZERO expectations. And, January in the rain? UGH. That’s a serious badazz conquest racing in that! Many times the best runs or races are the ones when we have no expectations. I am glad you had fun because that is definitely important. I’ve heard about the virtual half but not sure if I want to pay more now to bypass the lottery next year. I guess the question is how bad do I want to run the NYC Half next year? I am going to try again for next year! Hopefully this time I get a “Yes”. I am so glad that you not only finished happy, but strong. To me, that’s the #1 most important thing! I’m also glad that the weather wasn’t as bad as predicted. I was so worried that you would all have to run in tons of snow or ice. Me too — I was more worried about the ice if we’d had freezing rain. Well I would call this a huge win! Finishing happy and strong and feeling like you ran all of the hills is surely the best outcome. Time is not everything. Hope you are proud of your accomplishment-congrats! Yes. I think that surprised me the most. I expected it to be way more of a slog than it was, but I guess a year of base paid off in unexpected ways. Thank you! I love your race recap it’s very positive! I mean there were not really any negatives except the weather and yeah what are you going to do about that right? Great that you got a new jacket! I still don’t have a very good jacket so I am really all over the place with layers in the colder / rainier months. I mean you said you would have blown up had you gone for 2:30 but 2:42 is not really that much slower, at least in my opinion. When I ran Brooklyn RnR I think I had somewhere around 2:40 because 1) rain and 2) Prospect Park and 2) huge blister on foot from walking too much the day before. I was super happy with that. How awesome that you ran all the hills too! I find hills still really challenging!! Maybe not forgetting my head if it wasn’t screwed on moments (I’m a LIST person, I have to make a LIST even if it’s almost the same every time and then I have to CHECK it 1000 times haha!) but I know I’ve had wardrobe issues. Like the (extremely) wrong underwear kind of moments or bringing headphones etc and then leaving the ipod at home (that’s how I learned to run without music). Make a list – then before you leave make sure you can check everything off ! No more forgotten fuel! I think Liz is doing Liverpool too this year. Do you two read one another? Yes, we read one another and were hoping to meet up there this year. Yay! I realized after that it was in one of your posts that you two mentioned the mutual friends. I love that you loved everything about this race! Believe me, I’m sure I’d be complaining about the weather. Even though I’d rather be cold than hot I don’t really appreciate either. I’m really glad that you’re feeling go so it’s all ahead Ft. Lauderdale. I once went to a race (in another state) and left my handheld water bottle (which was what I was using at the time) on top of the car we didn’t drive in. I relied on water stops, it was actually a rather hot hilly race and yet I managed to PR. Really, you just never know what’s going to happen in a race. I rarely get out of the house without *almost* forgetting something I need. Great job & a great attitude — Congrats! Oh I was whining about the weather, but I really couldn’t complain about temperate January. I’m with you though, give me cold over hot. Thank you! I loved reading your recap! Congrats on a great race in under less than good conditions. 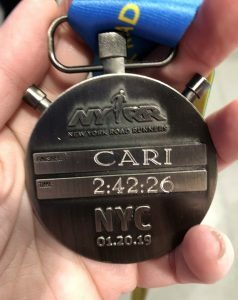 How cool that you can get your medal engraved after the race! When I was running marathons, the Marine Corps was my favorite and I ran it ten times. Brilliant work, well done. So strong on those hills! Yes, the day before so I could run round and buy a gatorade bottle with the holes in the top that I could drink out of, as I’m fussy about spouts!